I recently shared my business experience with a group of university women representing various countries who were interested in working for an American company. The eleven success tips I shared with them were neither gender nor culture specific, and applied to individuals interested in working for U.S.-based corporations, as well as service providers delivering products and services to global companies. Their questions quickly shifted the presentation’s focus from a pure business-centric one to an informal discussion on my roadmap for life. 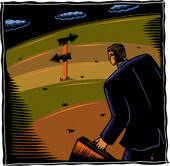 11) Take more risks, fail faster, and accept responsibility for your choices. 10) The best part of business is the people we meet along the way. 09) Communicate as if there is a tomorrow to remind you of yesterday’s words. Becoming a corporate entrepreneur (CE) supplier is tough work. First you need to master entrepreneurial skills and then build out your CE supplier skills. Whether you’re part of a supply-chain, a member of a small service provider, or even a solo boutique supplier, the size of your business isn’t nearly as important as knowing how to differentiate yourself from the competition. Over the last twenty years I’ve worked multiple sides – buy side and sell side – of the supply-chain fence. On the buy side I’ve managed strategic service suppliers, coached a vendor who went on to receive the Baldrige National Quality Program award, and sourced suppliers for multi-national and global corporations. On the sell side, I’ve supplied products and services as part of a supply-chain, SMB service provider, as well as a one-person outfit servicing the global playing field. I guess you could say that I know the pain and glory from multiple perspectives. There are seven supplier actions you can take now to differentiate yourself from your competition. I can remember a time in my career when I was in such overwhelm with my workload that I struggled with setting priorities and balancing strategy with tactical minutiae. Because of this I often found myself stuck when making the "big" decisions in meeting my goals. Heap upon this a company’s values and reward structure built around processing more data, faster, with better results and you get the stress picture. Sitting in front of my computer one evening watching the clock tick towards 8 PM, I knew that if I didn’t figure out a better way to get my job done, I would be out of a job – by choice or by invitation. Amazing how chaos plus deadlines will often generate innovative ideas (if we don’t shut down in overwhelm)!